After two preliminary rounds our quest to identify the best Quadrupel Ale in the world has reached the final stage. The final round will be presented in two parts: this post where we meet the finalists, and the follow up where the results are revealed. For the visual/audio learners out there I’ve captured a video version of the post which you can access here. For those of you who prefer the written word I’ve summarized the key points from the video in the text that comes immediately below the video. 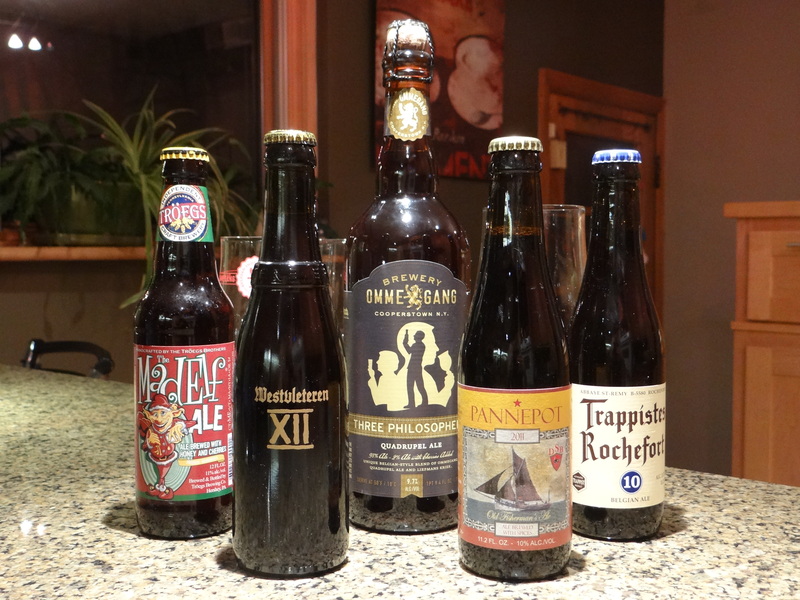 This post introduces the five beers that square off in the finals. I know those of you who have been following the previous blogs are saying, wait a minute I thought there were only going to be three beers in the final round. Well I’ve added one American brewed selection that missed round 1 because of availability issues, and I’m giving a second chance to one Belgian brewed entrant that was beaten in round 2, based on its reputation and my prior love for this beer. Ommegang’s Three Philosophers (9.8% abv, BA Rating = 4.14, RB Rating = 3.82, $10 per 25 oz bottle) This beer was the winner of Round 1 beating out The Reverend (Avery), Weyerbacher Quad, and Trader Joe’s Vintage Ale (Unibroue). For more details see the Round 1 post. De Struise Pannepot (10.0% abv, BA Rating = 4.37, RB Rating = 4.21, $7 for an 11 oz bottle) This beer was the winner of Round 2 beating out St. Bernardus Abt 12, Rochefort 10, and La Trappe Quadrupel. For more details see the Round 2 post. Rochefort 10 (11.3% abv, BA Rating = 4.52, RB Rating = 4.31, $6 for an 11 oz bottle) This beer finished in last place in Round 2, but as one of the most loved quads in the world and a personal favorite of mine, I couldn’t believe it went down. So I put it into the final round anyway to see if the Round 2 result was a fluke. Tröegs Mad Elf (11.0% abv, BA Rating = 3.87, RB Rating = 3.52, $15 for a 6-pack) Not technically a quad, but at 11% abv this big malty, fruity holiday seasonal is very much in the same spirit as a quad. Tröegs, located in Hershey, Pennsylvania, makes a number of world class beers, but is not generally known for Belgian-style ales. This beer, sold around the holidays, is a decadent winter treat made with Pennsylvania honey, sweet and sour cherries. I wanted to include this beer in Round 1 but it was sold out at the time, so I’m entering it here in the final round. Westvletern XII (10.2% abv, BA Rating = 4.63, RB Rating = 4.45, $85 for a 6-pack) The beer geeks out there need no introduction to this beer. Unlike the other Trappist breweries the monks at Westvleteren, the smallest of the Trappist breweries, carry out all of the brewing operations. Their strongest beer, Westy 12, is the top rated beer in the world on RateBeer and holds the #7 spot at BeerAdvocate. One generally has to visit the brewery to buy their beers and then only a limited number are sold. Here is a link to one post about the lengths normally required to get your hands on a Westvleteren XII. A limited number of special 6 packs were made available in the USA for the first time last year to raise money for upgrading the brewery (at $85 per six pack), and that is what we are drinking tonight (courtesy of my friend Mike Lufas0). The judges in the final round are different than in Rounds 1 and 2. The three person panel includes yours truly, and my friends Ted, who is a relatively new but enthusiastic convert to the world of great beer, and Chris, who is a beer enthusiast, home brewer, and Canadian ex-pat. Chris brought along his own take on a Belgian quad, Ville Billies. An open fermented beer that was originally an attempt at a Lambic, but whose alcohol content was amped to quad-like levels through two rounds of polar vortex concentration. Next Post: The Final Round Part 2, The Winner is ….